Stupas are full of symbolism, with every aspect representing a facet of the Buddhist spiritual path - indeed, traditional Buddhist cosmology considers the entire universe itself to be a gigantic stupa. They are constructed from five basic geometric shapes, each of which corresponds to one of the five elements of Buddhist philosophy, with each element also representing one of the essential attributes of an enlightened being. The square base of the stupa symbolises earth and equanimity, while the round dome represents water and indestructibility. The Boudhanath dome is huge and is freshly whitewashed every year - while I was there the bamboo ladders were just being erected ready for the annual paint job to commence. Above the dome, the triangular "spire" symbolises fire and compassion. 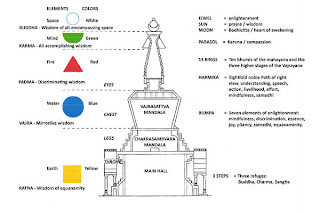 The square tower forms the lower part of the triangle and has large eyes painted on all four sides to represent the omnipresence of the buddha. Below each pair of eyes at Boudhanath is the Nepali numeral 1 representing unity (which you can just about see), while above the eyes (and not visible in my photo) is a third eye, symbolising the wisdom and compassion of the Buddha. Above the tower, forming the upper part of the triangle, thirteen steps represent the thirteen steps on the ladder to enlightenment. At the top of the steps above the triangle is a semi-circular gilded parasol, corresponding to the wind and all-accomplishing action. 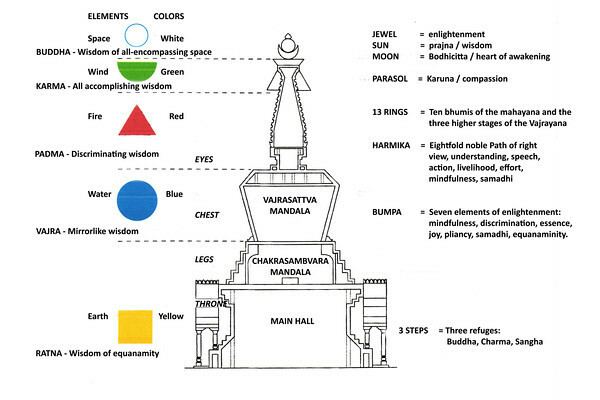 Finally, at the very top, the jewel shape pinnacle symbolises space and all-pervading awareness. Hundreds of prayer flags, known as wind horses, are attached to the stupa, and as they flutter in the wind they carry mantras and prayers to heaven. There are many other symbolic meanings, but I'd better stop now as this was supposed to be wordless, wasn't it? !